There’s nothing that makes this character unique at all. Even his costume looks like Spidey’s. 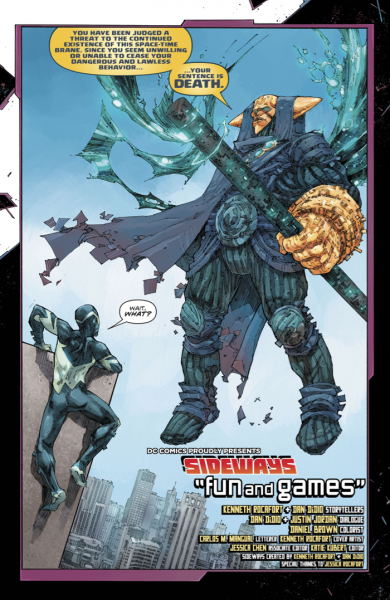 Spinning off DC’s recent Dark Nights Metal event, Sideways may promise to be part of “The New Age of Heroes” but it is anything but. That said, artist Kenneth Rocafort shows promise – even if he’s strongly riffing off Art Adams & Todd Macfarlane (!) – and redeems the comic somewhat. Dan Didio’s writing is sub-par and typical. Nothing much to see yet. Mm. Next Next post: PoP RECOMMENDS | RETROPOPOCK : NEW ALBUMS FROM DAVID BYRNE, YO LA TENGO, THE DECEMBERISTS AND GO-KART MOZART!! !